In the magical land of Ingary, where anything can happen, there lived a family of hat makers in a town called Market Chipping. Sophie Hatter was the eldest of the three sisters, which was unlucky because it was believed that the eldest child had the worst luck. Lately, a giant, moving castle, rumored to be the home of the evil wizard Howl, has been seen around the outskirts of town. One day Sophie is working at the hat shop when a strange lady comes in to buy a hat. When the lady, who turns out to be the feared Witch of the Waste, is not satisfied with any of the hats, she turns Sophie into an old lady. When Sophie realizes that she was cursed, she leaves the town in an attempt to start a new life. Sophie finds her way into Wizard Howl’s moving castle, and meets a fire demon, Calcifer, and Howl’s apprentice, Michael. Calcifer promises to break Sophie’s curse if she can break a contract that he made with Howl. 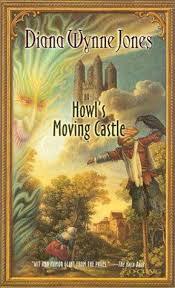 Sophie is mystified by the castle and the magic, but when Howl returns, he is angry at Sophie for barging into his castle and organizing his belongings. Howl is so mad that he uses his magic to create green slime, mess up the house, and enrage Sophie and Michael. After a while, Howl calms down, and Sophie’s real magical adventures begin. She tries to help Michael with a spell he’s completing, and even plays the part of Howl’s grandmother to negotiate with the King! Later, Sophie realizes that Howl is in love with her sister, Lettie Hatter. She also becomes caught up in the conflict between Howl and the Witch of the Waste. Whatever can happen will happen in this crazy, magical adventure!